We heard about GDDR5X a few months back, as a rumor and it has finally been officially published as a standard by JEDEC (specifically JESD232 GDDDR5X SGRAM). The memory proposes to roughly double the data rate offered by conventional GDDR5 ram while keeping the power footprint in check. In fact, in our initial computations – you might remember we landed on a maximum 448 GB/s number – something JEDEC has now confirmed. HBM2 was published a while back as well and while a 1 TB/s memory setup makes perfect sense for a high-end graphic card, GDDR5X is better positioned to target the entry-level offerings by both companies. There have been (unconfirmed) rumors that Nvidia and AMD could leverage the memory standard in some of their offerings although this remains to be seen. The point we have to keep in mind is that while GDDR5X is not GDDR5, the transition from GDDR5 to GDDR5X is actually less difficult than the transition from GDDR4 to GDDR5 or the transition from GDDR5 to HBM. GDDR5X will be able to offer bandwidth per pin of up to 14 Gbps – which is double that of GDDR5 which can push up to 7 Gbps per pin. Not only that this improved performance will come at a lowered power cost – so a maxed out GDDR5X configuration will actually consume less power than a GDDR5 counterpart. Since the memory can only offer bandwidths up to 448 GB/s (with a 256 bit Bus), it will remain unfeasible for higher end offerings – leaving HBM free to cater to that. In fact, the company Micron has stated on more than one occasion that GDDR5X is not being pushed as an alternative to HBM – rather as a complimentary product. 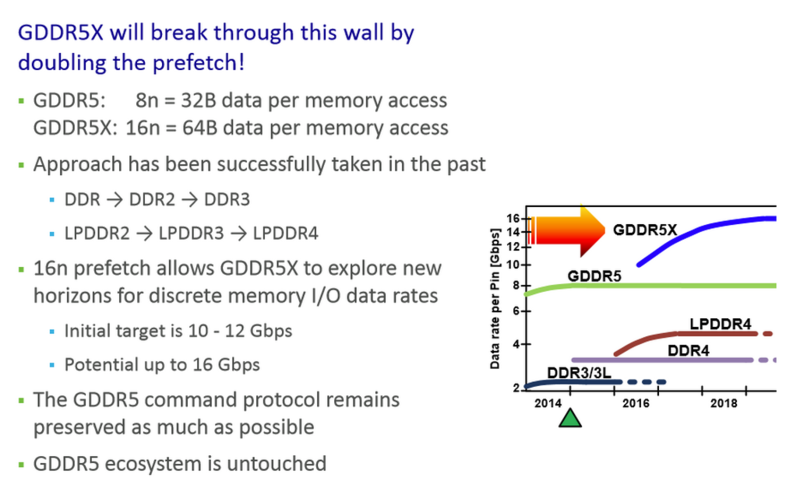 As opposed to a 32 Bit wide memory access of GDDR5 , the GDDR5X supports 64 Bit wide (double the prefetch) memory access, theoretically doubling the memory bandwidth. Although the foot print or the real estate taken by the memory (something which was one of the problems associated with GDDR5), on the card itself, will halve in size – thanks to the fact that Micron has managed to double the density of GDDR5. The company is expected to make a formal announcement in 2016 – with availability of the standard in 2016 as well. JEDEC Solid State Technology Association, the global leader in the development of standards for the microelectronics industry, today announced the publication of JESD232 Graphics Double Data Rate (GDDR5X) SGRAM. Available for free download from the JEDEC website, the new memory standard is designed to satisfy the increasing need for more memory bandwidth in graphics, gaming, compute, and networking applications. Derived from the widely adopted GDDR5 SGRAM JEDEC standard, GDDR5X specifies key elements related to the design and operability of memory chips for applications requiring very high memory bandwidth. 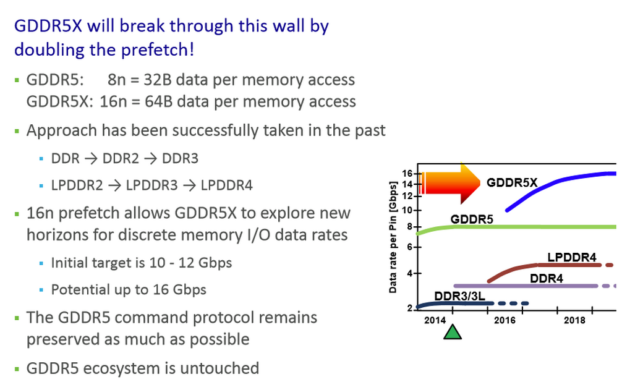 With the intent to address the needs of high-performance applications demanding ever higher data rates, GDDR5X is targeting data rates of 10 to 14 Gb/s, a 2X increase over GDDR5. In order to allow a smooth transition from GDDR5, GDDR5X utilizes the same, proven pseudo open drain (POD) signaling as GDDR5.